Mixcloud 'Best of 2012' – The global community for audio culture. 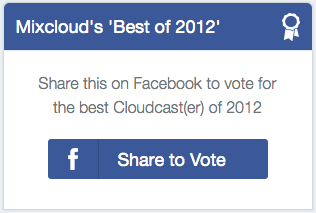 Voting for the best of 2012 on Mixcloud is now open and closes December 17th at midnight. If you’re looking for who to vote for, why not take a quick look back through the 2011, 2010 and 2009 winners in the Best of Mixcloud here. Stay tuned for the results in the new year. Happy voting! Next articleBlogWho to turn to when things go wrong. Or incredibly well.